When Chaim and I decided to celebrate our 14th wedding anniversary in Montreal, a place we could easily take a train to (albeit a LONG train-ride and a troubling one — FOURTEEN U.S. border guards came on-board to grill us before we entered Canada, only to go through it again on the Canadian side), we did not realize that we would be here to witness an amazing exhibit dedicated to Leonard Cohen on his first yahrzeit at the Museum of Contemporary Art. For those of you who are Leonard Cohen fans, the exhibit lasts until April. 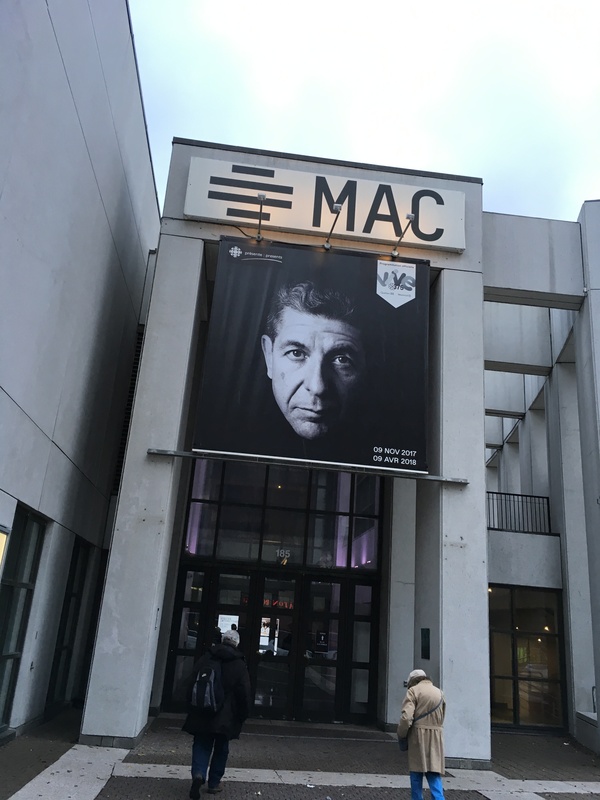 It is a must-see (honoring Cohen as a painter, songwriter, musician, writer — he did not consider himself a poet — and humanitarian); I already want to come back. 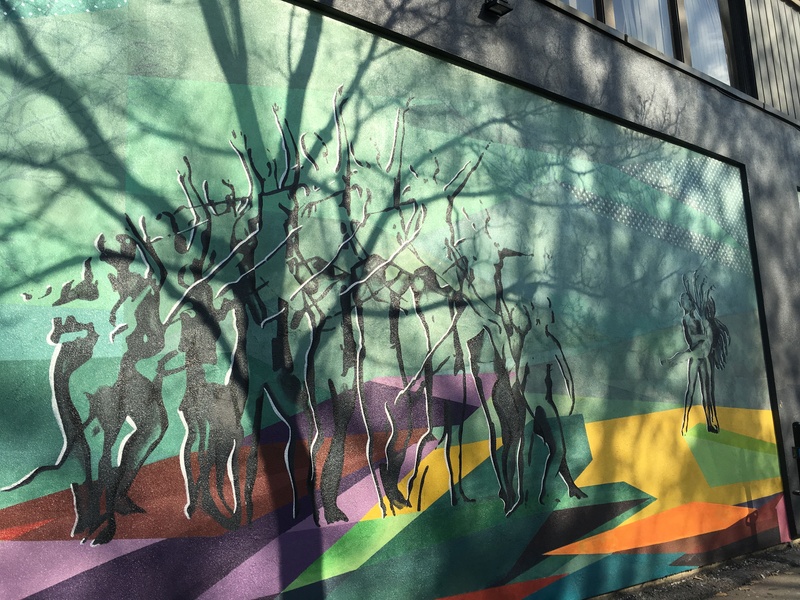 The tree is a shadow, not part of the mural itself (Blvd. St. Laurent). 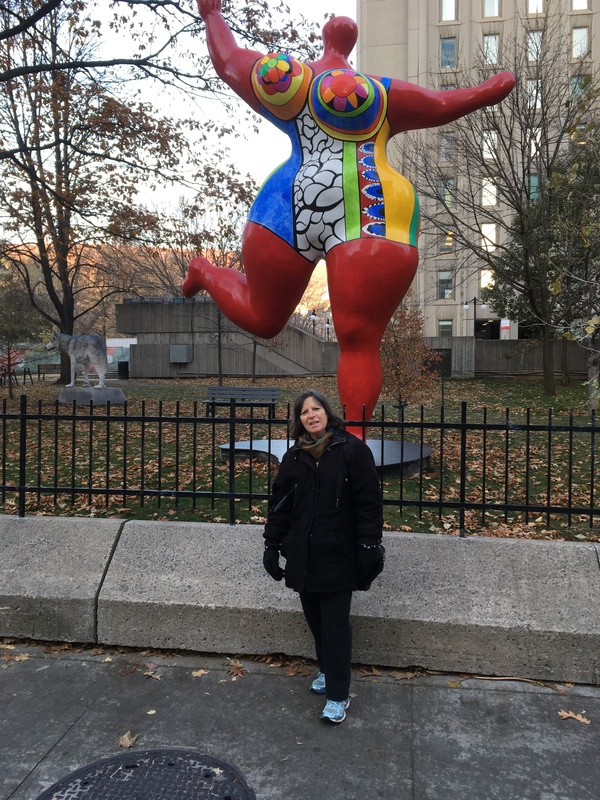 Chaim found a friend (on Sherbrooke). 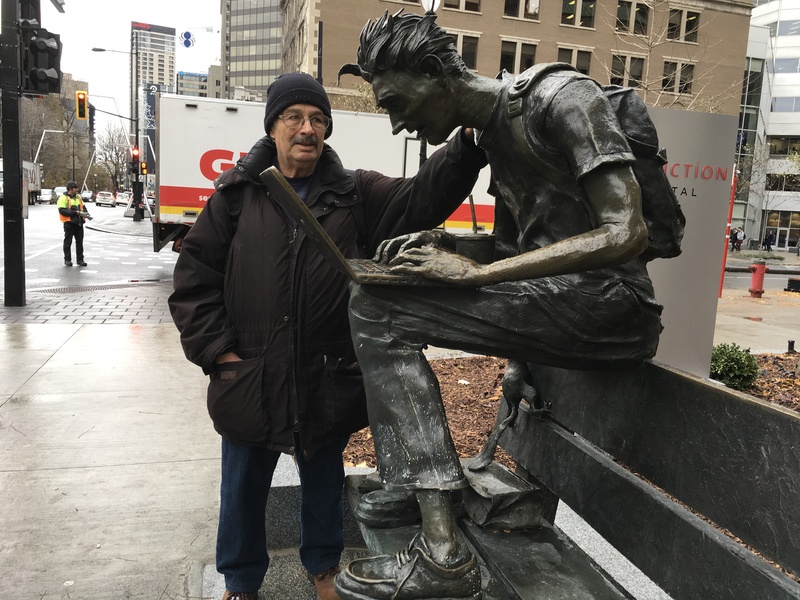 Here I am with my zaftig friend (on Sherbrooke). 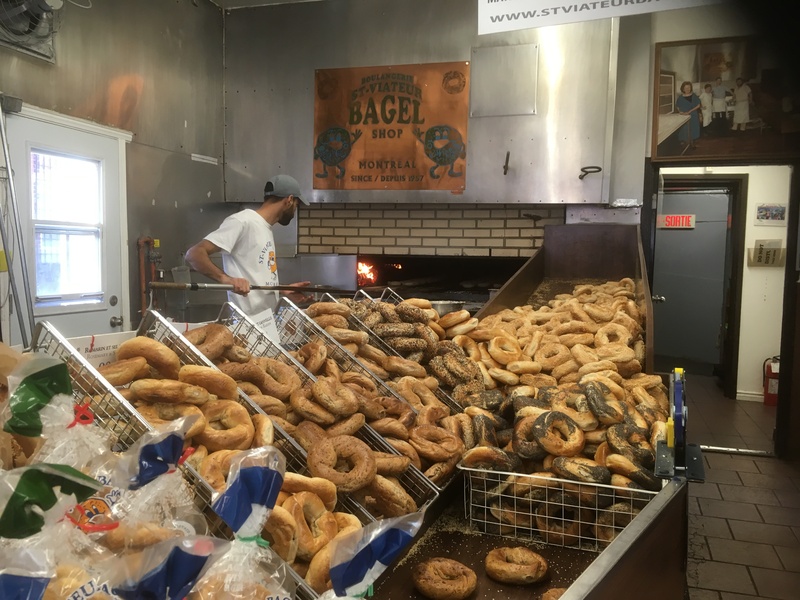 The bagel maven at St. Viateur bagelry! and (3) great vegan food at two other restaurants (all while staying within my allotted Weight Watcher points! 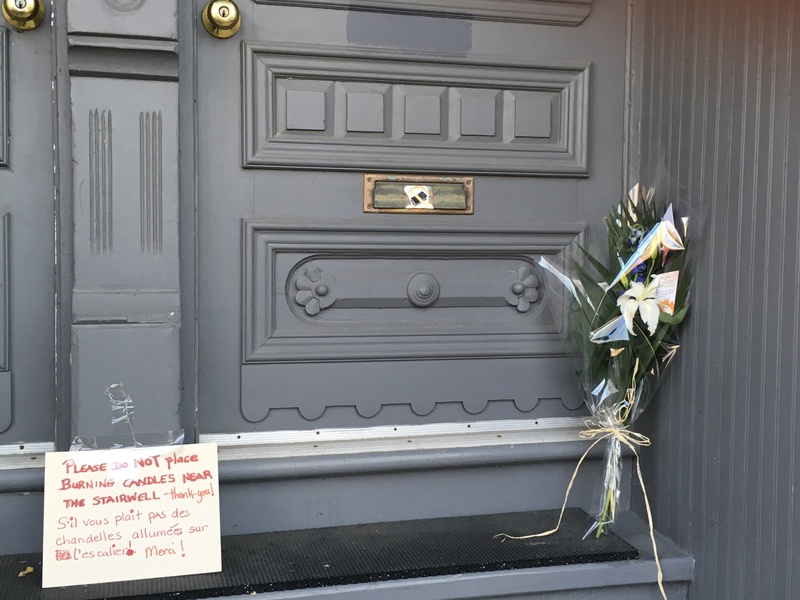 ), and paying homage to Leonard Cohen’s home, where flowers were left to honor his yahrzeit, in addition to a sign requesting that no burning candles be left. Today we took a 4-hour bus tour for a fuller overview of the city and then went to the contemporary art museum before going out for our anniversary dinner at an elegant vegan restaurant. 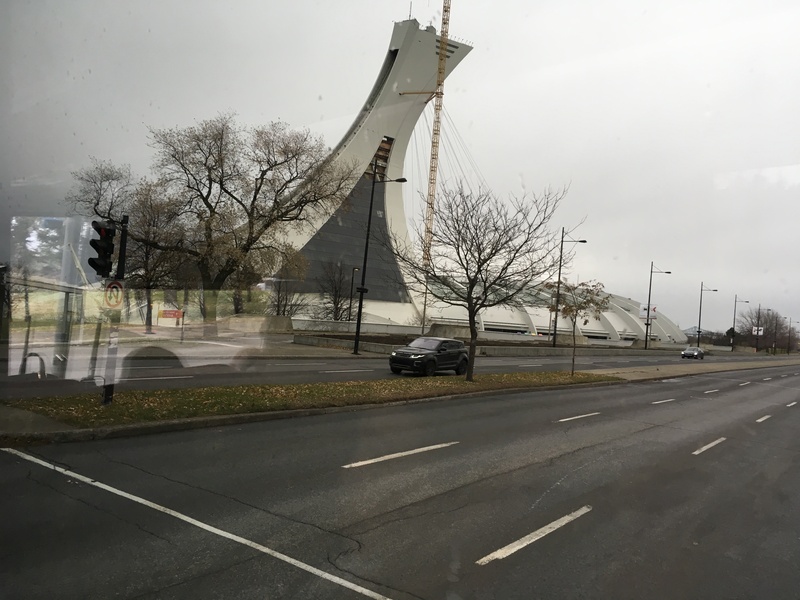 I had first been to Montreal when I was 16 on a teen trip to see the 1976 Olympics. Here is a photo of the Olympic Stadium, which I remember from then, 40+ years ago. Olympic Stadium from 1976 summer Olympics, later used for now-defunct baseball team. I next visited Montreal within the year after I was ordained, 1994 or 1995. I had gone on a women’s Outward Bound canoe trip as part of my ordination rites (I felt that I wanted to add a physical component to the spiritual, intellectual and emotional challenges that my rabbinical school training had offered), and one of the women from that trip lived in Montreal at the time, so I had come to visit her with another friend from that adventure. 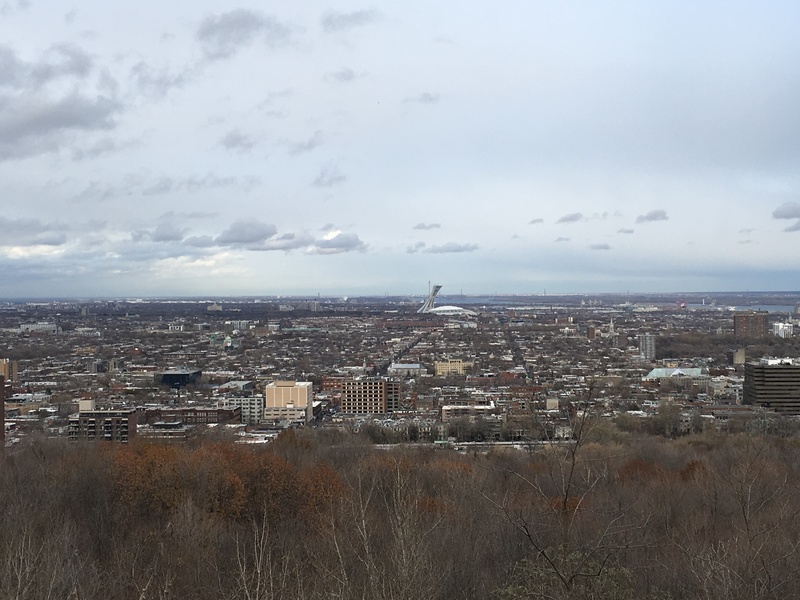 What I remember most was our trekking around on Mont Royal. Here is today’s view from the top. View from top of Mt. Royal. The Olympic Stadium can be seen on the horizon just to the right of center. We are looking forward to Shabbat at the Reconstructionist synagogue here, Dorshei Emet. I hope I return to Montreal before another 20 years goes by. It’s a great city! Mazel tov on your 14th Anniversary and your return to Montreal. May the rest of your time there be as fulfilling and fun-filled. Sounds fabulous, Pam. Thanks for the reminder about Leonard Cohen’s yarzheit. I am going to start listening right now to his music as I play with pens and brushes on a Bat Mitzvah gift. I’m sure it will influence the flow of colors and design. I love that you approach life through eyes of wonder. Mazel tov on your anniversary, Pam! Sending you a big hug and much joy. Mazal tov on your 14th anniversary. I am delighted you chose Montreal to celebrate in. It is one of my favorite cities. 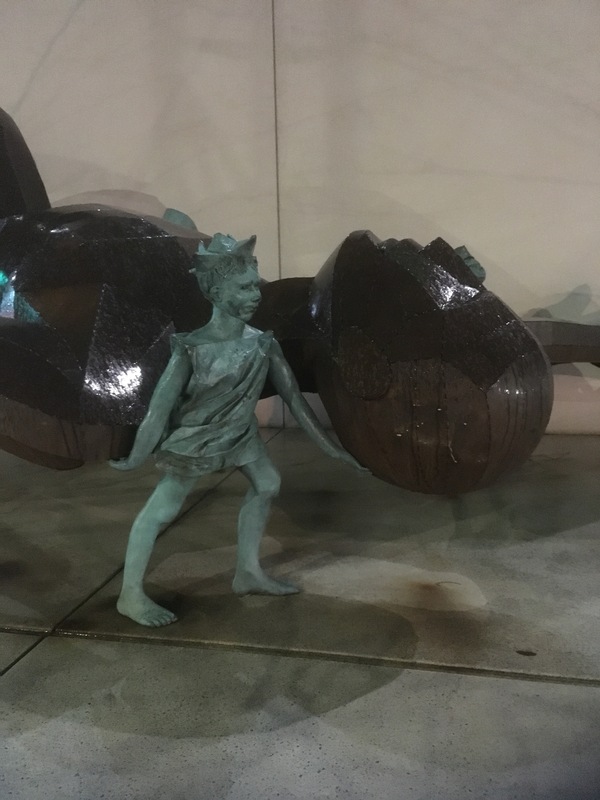 Fabulous trip report, Pam…you make me want to go (although I could do without all that border control)! Sounds like great fun, food, and adventure while celebrating your anniversary together. Mazel Tov!